There’s another social media craze called: Pinterest; as if our world needed another form of social media. Of course some of you reading this already know all about it. But I’m sure there are a few of you who have no idea what I am talking about. No worries, I was like that about a year or so ago. 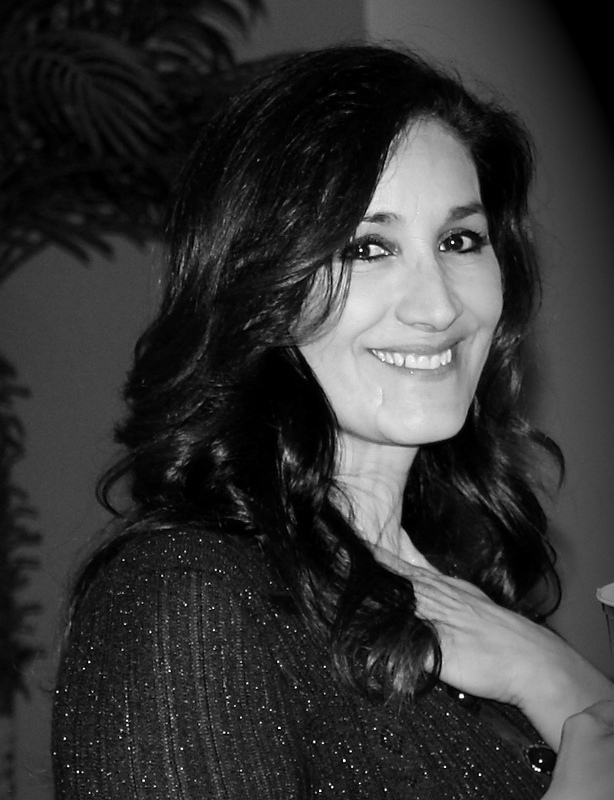 I first learned about Pinterest from my daughters, as with all of the other social media…. I needed their help with navigation. In the beginning I resisted; I needed another time sucker like I needed a hole in my head. But the more I thought about the concept the more interesting it became. I want to share with you a few reasons why I think Pinterest is so cool. Every success guru, Christian or not suggests having a dream board in order to achieve success. The idea behind a dream board is to have it before your eyes. I fully believe that is a Biblical concept. You must see it with the “eyes of faith” before it becomes a reality in your life. The Lord told Habbakuk to write the vision and make it plain so he could run with it”. Proverbs 29:18 tells us: “where there is no vision the people perish”. The Lord encourages us to have a vision and to write it down so it is kept before our eyes. This is exactly what Pinterest is: an online dream board, a place where you can dream. You can make different boards and fill them with endless possibilities. I have a home décor board, one for fashion, for places I want to go, one for home designs, one for outdoor living and several others. With Pinterest there is no mess, no cutting, no pasting; it’s cheaper because you don’t have to buy magazines. All you have to do is click on a picture you like to pin it to your board. One day I stumbled across some scrapbooks I made when I was first married; my oldest daughter Ariana was intrigued by them. After showing her, my books filled with cut out pictures from magazines of fashion, jewelry, dream homes, home décor and garden ideas. She said: “Mom that’s what Pinterest is!” I suddenly understood the concept after seeing my antiquated form of Pinterest. My mother was the queen of junk drawers filled with craft how-to’s and party ideas. Now you can get rid of that junk drawer, by storing all those ideas in one place. Pinterest is the “in place” for brides to find wedding ideas. What’s so cool is most of this stuff is DIY (do it yourself) which always cuts down on expenses. 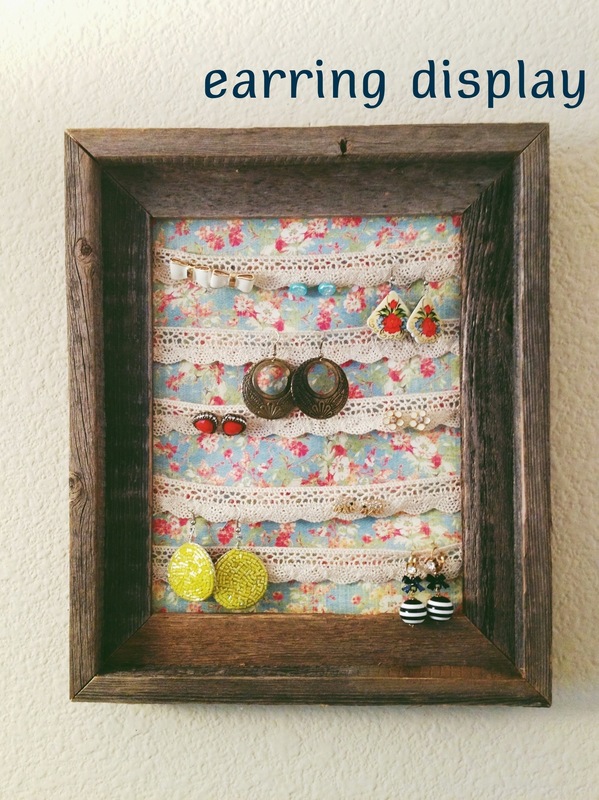 My daughter Rachel found a great idea for making an earring display, her cost: under $10. I love to collect recipes; which poses two problems. First, I rarely make them because I am either too busy or watching my weight. Secondly, where do I store them? I have dozens of manila folders filled with ripped out recipes from magazines. Not to mention all the cookbooks I have purchased. “Where are they now?”…..in a box in storage. 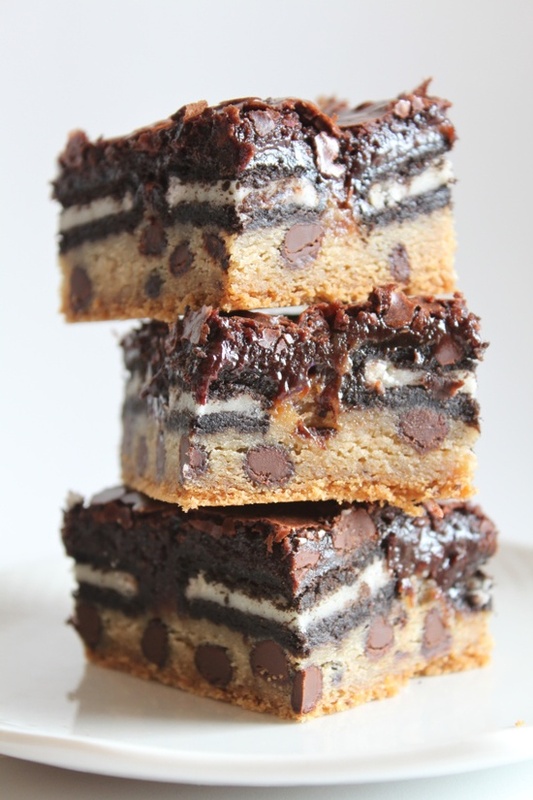 With Pinterest you pin the recipes that look incredible and when you need them, there they are right on your computer, ipad or smart phone. I just set up my laptop in the kitchen to follow the instructions. 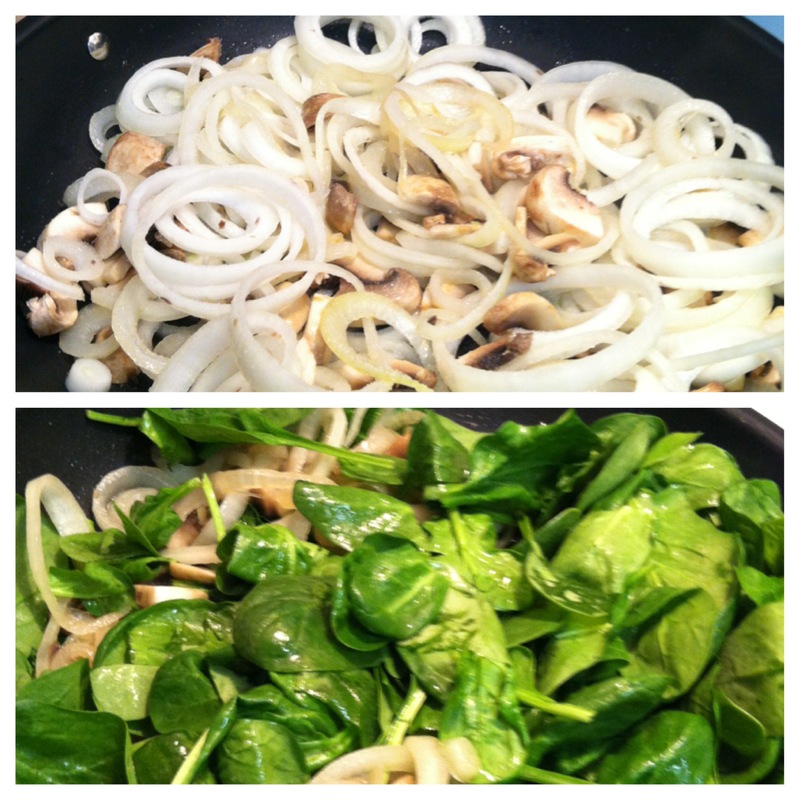 Here are two recipes I found on Pinterest and tried them….YUMMY! In Bessieres,Haute-Garonne, France they have an annual Easter omelette fest, where they make a giant omelette in a giant pan in the middle of the town. Legend has it that the omelette became famous when Napoleon and his armies were traveling through the south of France. They rested one night near the town of Bessieres. 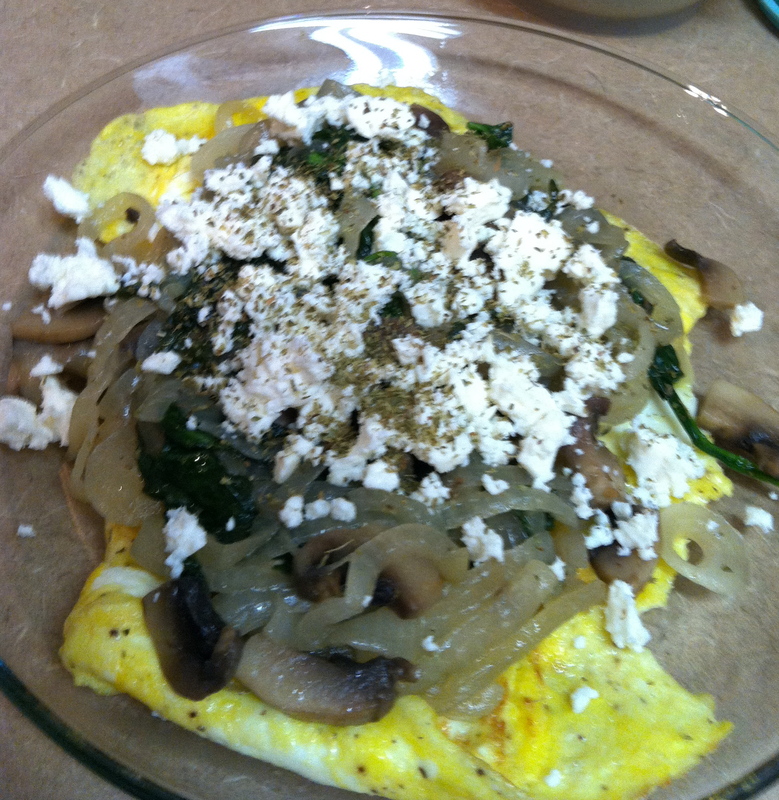 A local innkeeper prepared an omelette for Napoleon, who loved this culinary delight. Napoleon ordered all the towns people to gather all the eggs in the village and prepare a huge omelette for his troops the next day. This founded Bessieres tradition of the Easter Omelette. 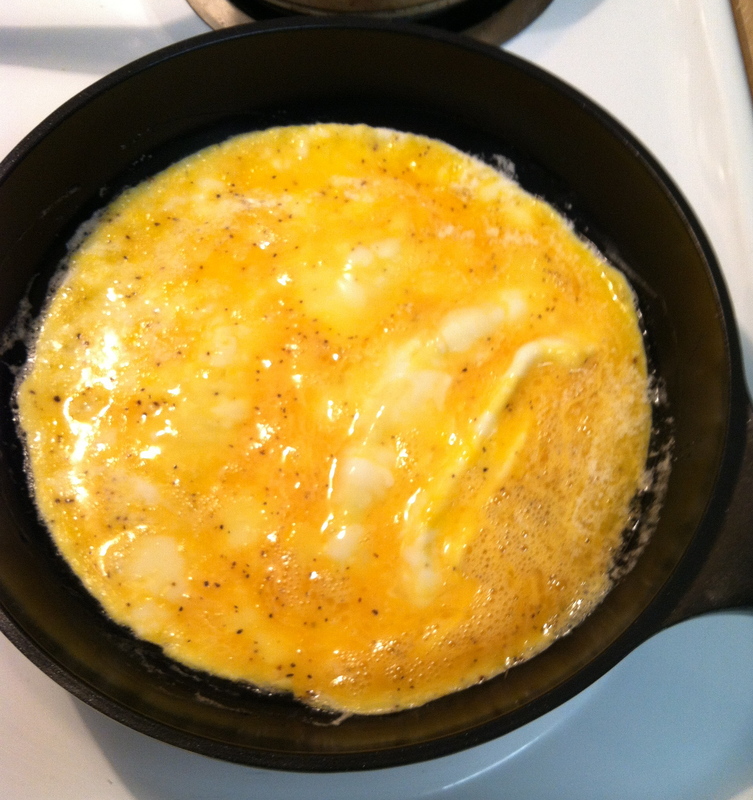 An Omelette is a dish of beaten eggs cooked in a frying pan until firm, often with a filling added while cooking, and usually served folded over. I like to get really creative with my fillings, as you will see below. Recently I really have been into making omelettes for my husband. 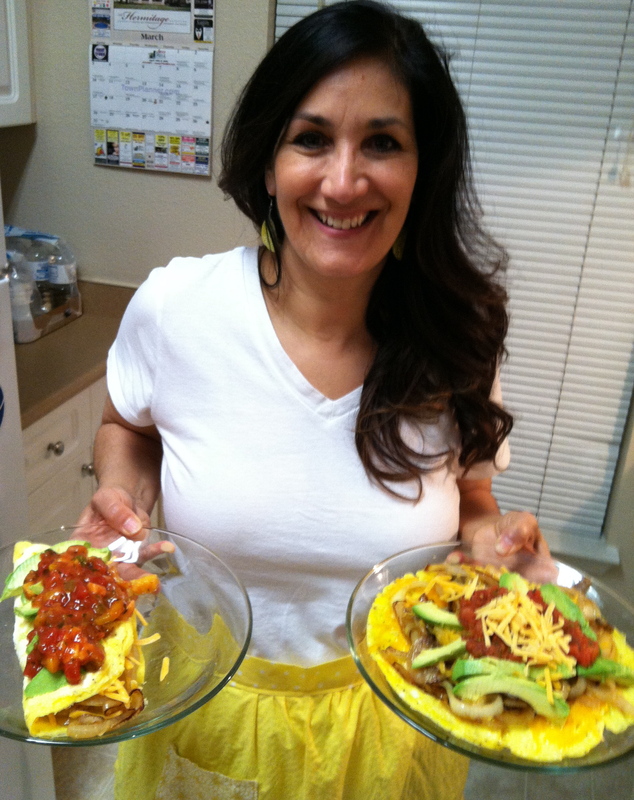 I have always enjoyed making them with my microwave omelette maker. However, at the present moment I don’t have a microwave, so that led me on a quest for a simple technique of making an omelette in a frying pan. I have discovered there is an art to this. My first stop was at Recipe Wars on You Tube, then I proceeded to watch a few Julia Childs videos. This will get you started on how to make a basic omelette. I am Greek and because I am Greek I like onions and lots of them! 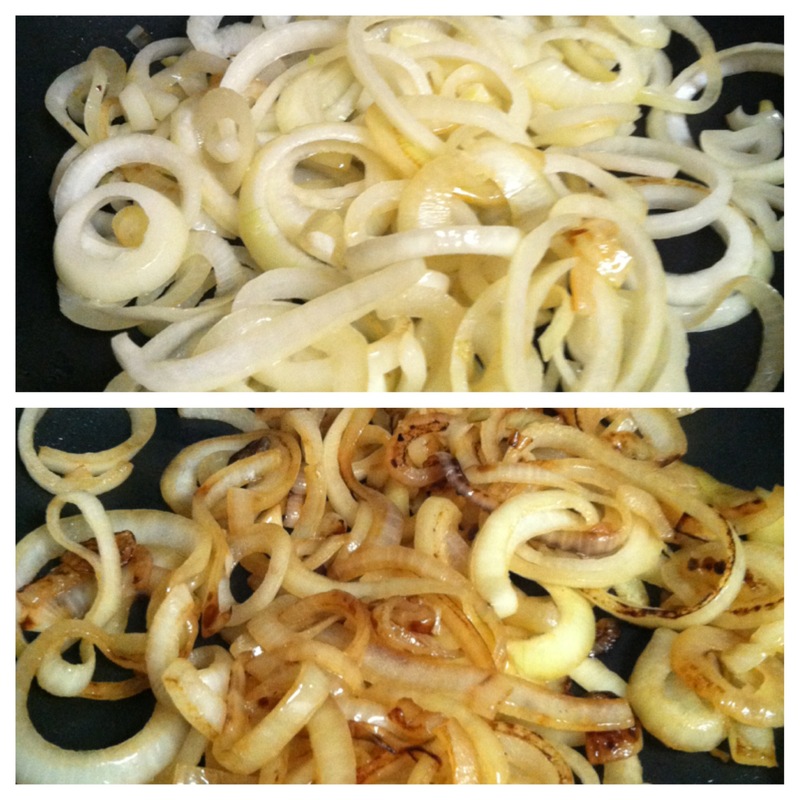 Slice the onions and separate the rings into a frying pan with a bit of olive oil in the bottom. I start the onions first because they really need to be soft and almost carmelized. This process takes about 30 minutes. Half way through I will add some sliced mushrooms and continue to sautee the mixture. 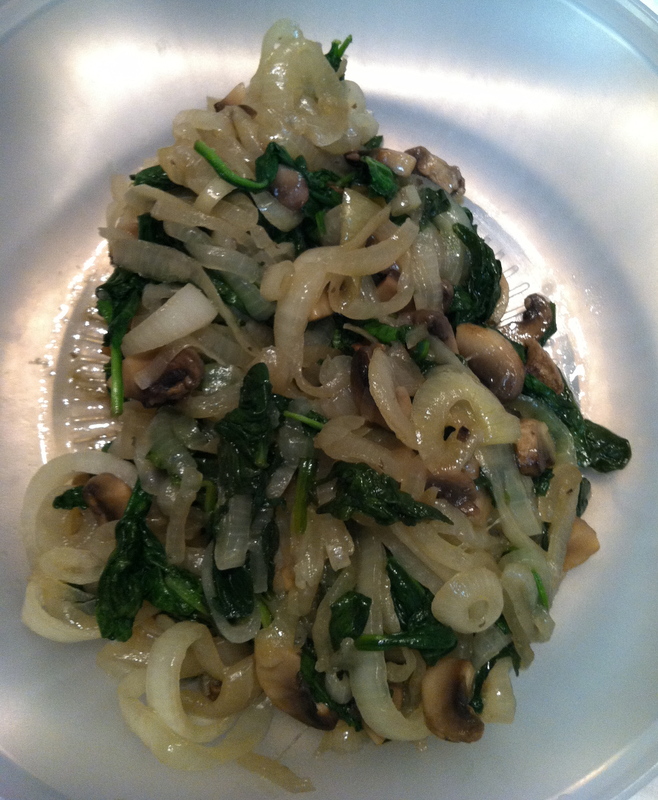 When the onions and the mushrooms are soft, add fresh spinach; continue to sautee until the spinach is tender. Keep warm. This is where you might want to check out those videos on technique. I have created my own and tend to make a huge mess….I am still trying to perfect my technique. I also tend to over cook my eggs because I hate wet eggs. While your filling is cooking get your eggs ready: 2-3 eggs slightly beaten with salt and pepper. Use a small frying pan and heat the pan on medium high. Melt approx. 1 Tbsp of butter in the pan; then when the pan is nice and hot pour in the egg mixture. The eggs should sizzle when you put them in. Cook to desired consistency. Drain the mixture of the liquid so it won’t make the eggs soggy. 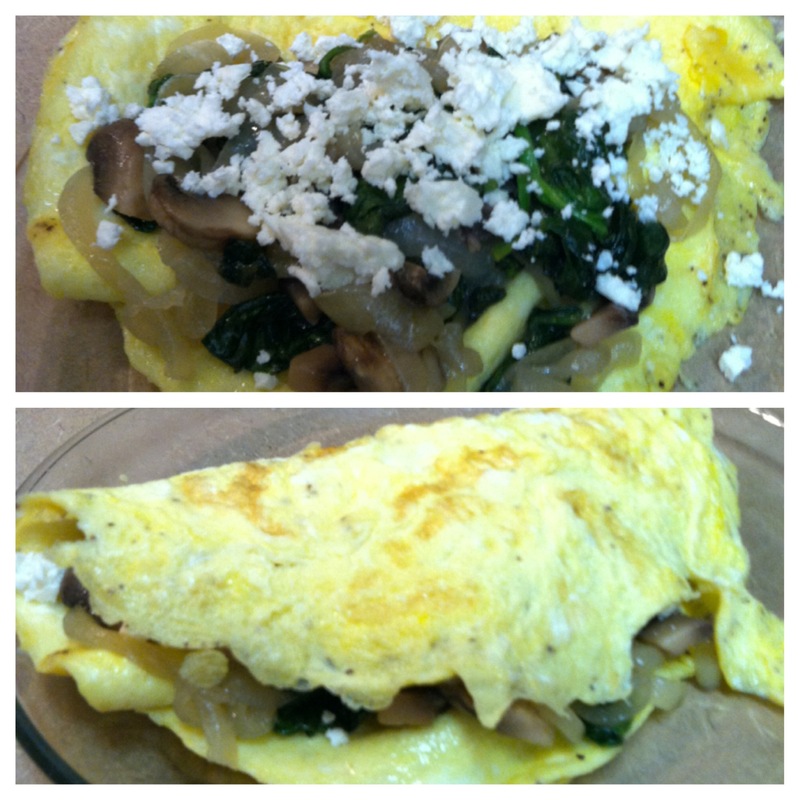 Fill the omelette with the filling and top with feta cheese. Then fold the other half over and top with more feta cheese and sprinkle with some oregano. Another option is to serve the omelette open faced. 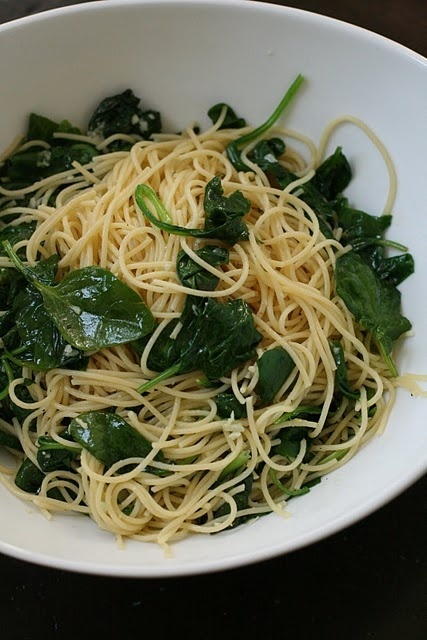 You can substitute the feta with mozzarella or grated parmesan cheese. First slice the onions and separate the rings into a frying pan with a bit of olive oil in the bottom. You want to sautee these on a medium – med/high heat for about 30 minutes. While the onions are cooking, get your egg mixture ready; 2-3 eggs slightly beaten add salt, pepper and if you want fluffier eggs you can add 1 tsp of water, cream or milk. Using your small frying pan, heat it up really hot, melting about 1 Tbsp of butter in the bottom. Cook eggs to desired consistency. 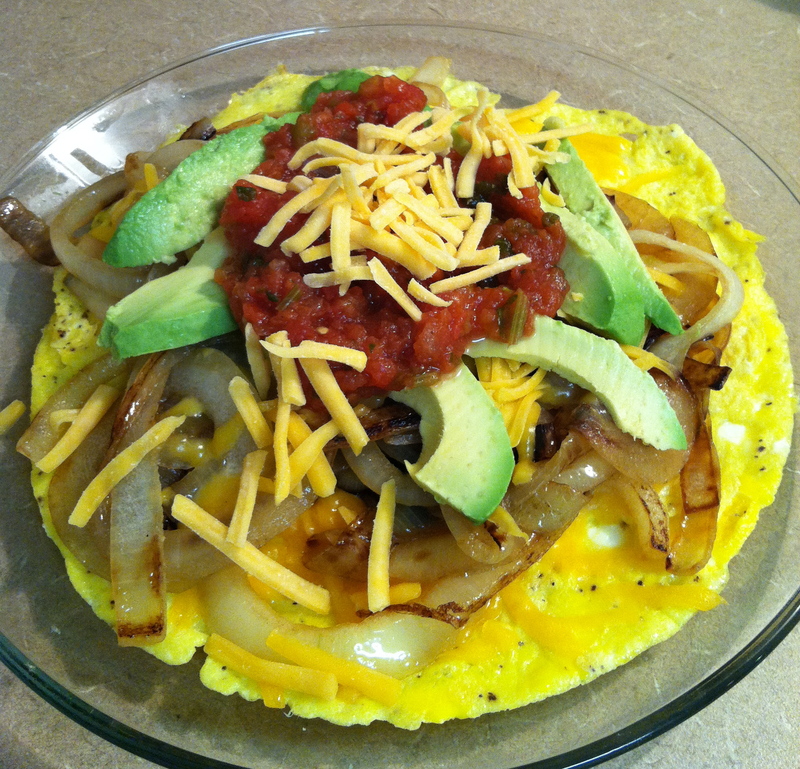 Top the omelette with the onions, cheddar cheese and avocados. If you want to melt the cheddar cheese place omelette in the oven (without the avocados) and heat until melted. Then garnish with salsa. 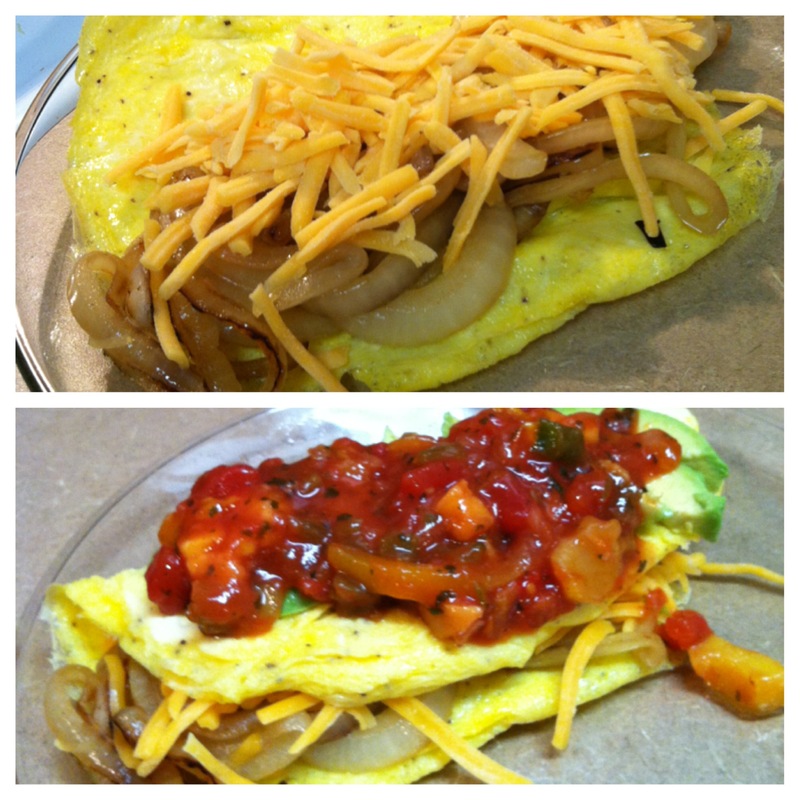 I have used regular salsa, but I’ve also tried a mango salsa that gave the omelette a totally different flavor. Sour cream might be nice as well! One thing I found out about omelette’s, you can’t really mess them up. My husband always says: “So what if they don’t look perfect, they still taste the same”! Get creative and make any filling that you think would be tasty and go for it!